Last month, a moment that mentors have been warning me about for years came to fruition — that moment when your work comes full circle and you find that “everything old is new again.” Like most youngsters, I assumed that when my wise elders predicted this eventuality, they were simply showing their age – grumpy and cynical. I assumed that surely once Texas reeled in policies that proved ineffective and harmful, those policies would be consigned to some high shelf in a back office of the policy division of the Legislative Budget Board. Gathering dust. A curious relic of a time when people didn’t know any better, but important to keep around in case we needed to be reminded of what NOT to do. Like Betamax and New Coke. Olestra. Lead in household paint, and BPA in baby bottles. We should keep the case study and learn from it, but then respectfully (and carefully) put it back up on that high shelf, vowing not to repeat that mistake again. That’s why I was dismayed to open Governor Abbott’s “School and Firearm Safety Action Plan” to find (among other ideas, both good and bad) the Ford Pinto of the education policy world: Zero Tolerance. The Governor’s plan recommends expanding the use of Zero Tolerance discipline policy, increasing the number of students subjected to exclusionary discipline through suspensions and expulsions. As America’s first subcompact econobox, the Pinto was developed to be built quickly and sold cheaply, a marketing ploy that turned out to be wildly successful – resulting in sales of millions of cars that had a structural defect that rendered them famously unsafe. Zero Tolerance discipline policy, first instituted in Texas schools in the 1990s, is the subcompact econobox of the school discipline policy world and, as such, it spread as quickly as the Pinto sold for many of the same reasons: it costs next-to-nothing and is off-the-shelf ready when you are. And heck, it just seems like it should work. Unfortunately, it too suffers from design defects that are almost as detrimental to a child’s education as the Pinto was to its drivers. It turns out that cheap and fast is no better for education policy than it was for car design. In fact, study after study confirms that Zero Tolerance policies do the opposite of what Governor Abbott suggests: rather than make schools safer, these policies undermine the climate of the entire school campus, leading to more disciplinary incidents rather than fewer. It also has disastrous consequences for the individual students who are disciplined. One of the leading studies on the issue, a longitudinal study of educational outcomes for close to a million Texas students that controlled for more than 80 variables, found that these disciplinary schemes were linked to an increased risk of grade retention, dropout, and juvenile justice involvement. In other words, Zero Tolerance school discipline policy — much like the Ford Pinto — is unsafe at any speed. And — of deep concern to us at Texas Appleseed — these policies are unevenly applied, with students of color and those with disabilities at increased risk of having their education derailed. The same Texas study found that, even when controlling for a host of variables including socioeconomic status, Black students and those with disabilities are far more likely than their peers to be subjected to discipline under these schemes. This is true despite the fact that other studies confirm that they are no more likely than their peers to misbehave, and still others that show that Black students are disciplined more harshly than white students for the same behavior. While we certainly agree with the Governor that threats of violence must be met with an immediate response, it is critical to respond in a way that is both likely to change that student’s behavior (which seems like it should be the purpose of any disciplinary response, right?) and proportionate. 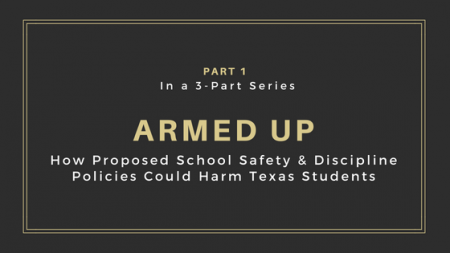 Over the course of the more than 10 years that we have been working on this issue at Texas Appleseed, we have seen, over and again, that Zero Tolerance policies lead to absurd results. Remember Casey Harmeier, the 12-year-old who was charged with terroristic threat (a felony) for accidentally setting off a fire alarm at his school in 2007? His father came and testified in support of early efforts to roll back Zero Tolerance policy. His testimony and that of other parents and students — many of whom were part of the now defunct (because they thought they’d won the battle) Texas Zero Tolerance organization — sparked a bipartisan movement to roll back Zero Tolerance policies in Texas. Thanks in large part to their hard work, the good news is that proven alternatives have been gaining traction in Texas schools. Some of these, like restorative justice, are mentioned in the Governor’s plan – but the plan suggests using them only after the student has been disciplined and placed in an alternative school rather than as preventative measures. Other bright spots, like the recommendation to increase the number of counselors in Texas schools, were not prioritized for the immediately available funding, and would have to wait until the legislature convenes in 2019, making them unavailable for another school year. This seems to miss the opportunity and the point of the plan itself — to prevent misbehavior and school violence before it occurs. Without access to funding for these and other alternatives, schools may simply reach for that cheap and easy fix. Let’s just hope we’ve learned better since Casey’s dad traveled to Austin to offer his passionate testimony about the need to relegate Zero Tolerance to the dustbin of failed ideas back in 2007. Some policies, much like defective products, need to be left in the past and never revisited. Zero Tolerance is one of them. 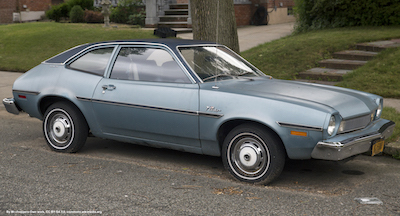 Texas students deserve better than the Ford Pinto of fixes for school safety.